The San Diego Chargers plan to announce as early as Thursday they are moving to Los Angeles, ESPN reported tonight, citing unnamed sources. There was no immediate response to an email sent to the Chargers seeking comment. The San Diego Union-Tribune reported the team will hold a staff meeting at 8 a.m. Thursday. The Chargers have notified NFL commissioner Roger Goodell and other league owners of their intent to move to Los Angeles for the 2017 season, according to ESPN. However, as one league source cautioned Wednesday night, Chargers chairman Dean Spanos had not sent a formal relocation letter to the NFL or notify public officials in Los Angeles or San Diego of the team’s move, or tell the members of the San Diego organization about his plans, ESPN reported. Spanos was given two more days Wednesday to decide whether to remain in San Diego or move the team to Los Angeles, the league announced. The extension of a deadline from Sunday to Tuesday came as team owners on the stadium and finance committees met in New York to discuss stadium situations in San Diego and Oakland. “The deadline for the San Diego Chargers to exercise the option to relocate to Los Angeles is January 15,” league spokesman Brian McCarthy said in a statement. The change was not unexpected, given the odd timing of the original deadline, and may not have much impact on Spanos’ decision, which he can make any time. However, the outcome of the committee meetings could affect the directions taken by the Chargers and the Oakland Raiders, who have been exploring a potential move to Las Vegas. Spanos has to decide whether to exercise an option provided by his fellow NFL owners last year to become the second team in the Los Angeles region along with the Rams. 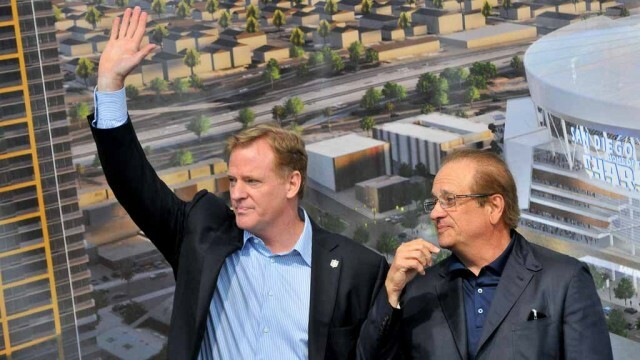 The Rams and the Chargers would share a stadium being built for the Rams in Inglewood, a city abutting Los Angeles. He could, however, be given extra time to work on a San Diego solution with city and county officials or be provided with extra money that would reduce the public’s share of the cost of construction of a new stadium to a level San Diego voters would consider palatable. He might also have more time if the Raiders’ Las Vegas bid is approved, which would remove any threat that they would go to the Los Angeles area themselves. Numerous news reports over the past year or so have indicated that some NFL team owners are reluctant to abandon the San Diego market. The movement in the Chargers’ long-running search for a new playing facility comes two months after the defeat of Measure C, which would have raised hotel room taxes to provide the public portion of the cost of building a downtown stadium. Because of the tax increase, the ballot measure required two-thirds approval to pass, but it failed to even get a simple majority. The challenge for Spanos and local political leaders who want to keep the Chargers in town is to formulate a funding plan that doesn’t involve tax increases so a future vote would require only a simple majority, and to keep the public contribution at a moderate level that would be supported by at least half of the voters. Another public vote on a San Diego stadium plan could take place next year, if incorporated into a scheduled election. ESPN reporter Jim Trotter said Tuesday via Twitter that a “Hail Mary is developing to keep the Chargers in SD at least two more years” and that the San Diego situation is believed to be “salvageable” by the league while Oakland’s is not.